Now that you've gotten your LED to blink on and off, it's time to up the stakes a little bit – by connecting six LEDs at once. We'll also give your RedBoard a little test by creating various lighting sequences. This experiment is a great setup to start practicing writing your own programs and getting a feel for the way your RedBoard works. 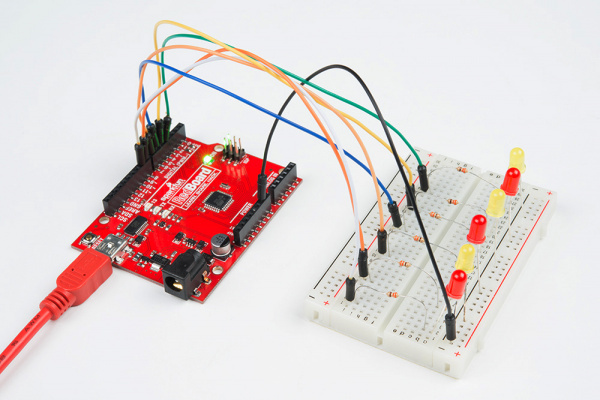 Along with controlling the LEDs, you’ll learn a few programming tricks that keep your code neat and tidy! Make six LEDs dance. Dance LEDs, dance! // To keep track of all the LED pins, we'll use an "array." //   3. index++   Putting "++" after a variable means "add one to it". // for index = 2, index = 3, etc. all the way to index = 5. When you have to manage a lot of variables, an "array" is a handy way to group them together. Here we're creating an array of integers, called ledPins, with six elements. Each element is referenced by its index. The first element is the index of . You refer to the elements in an array by their position. The first element is at position 0, the second is at position 1, etc. 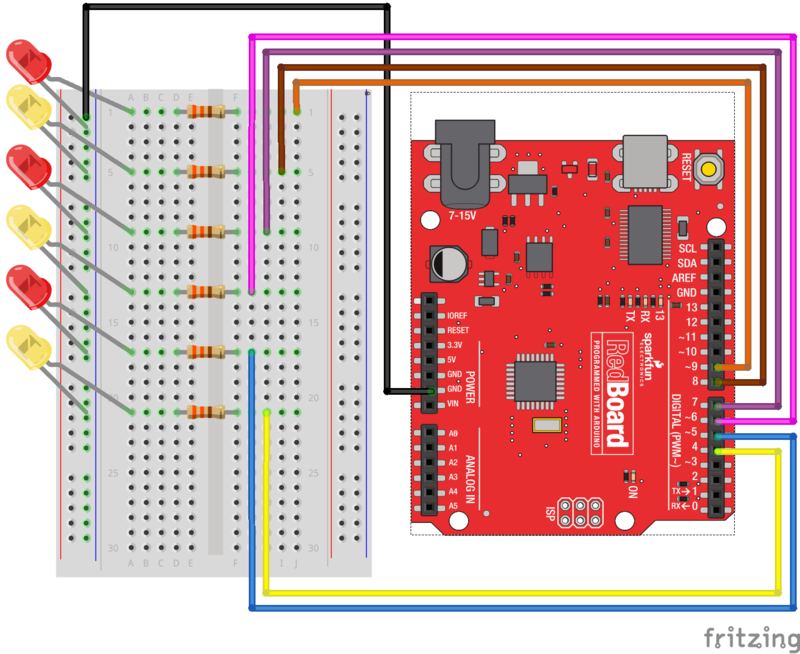 You refer to an element using "ledPins[x]" where x is the position. Here we're making digital pin 4 HIGH, since the array element at position 0 is "4." This is similar to Experiment 1, but instead of one LED, you should see all the LEDs blink. If they don't, make sure you have assembled the circuit correctly and verified and uploaded the code to your board, or see the Troubleshooting section. It is easy to insert an LED backward. Check the LEDs that aren't working and ensure they are in the correct orientation. With eight wires it's easy to cross a couple. Double check that the first LED is plugged into pin 4 and each pin thereafter.